Canada's Minister of Immigration, Refugees and Citizenship is making the rounds in Windsor-Essex. 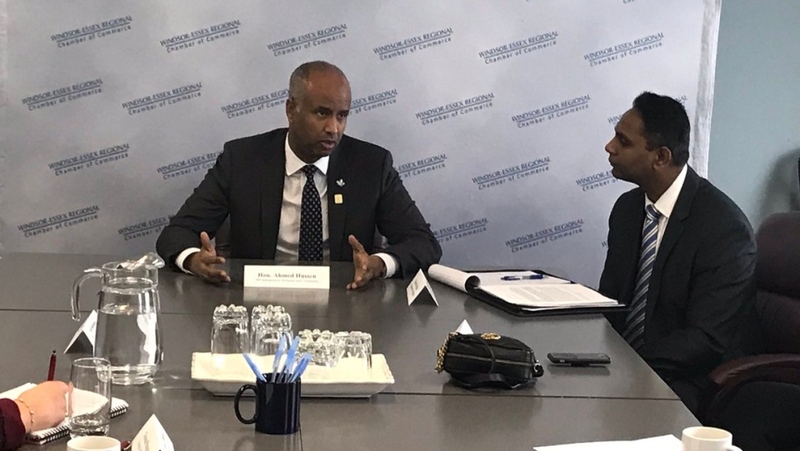 Ahmed Hussen took part in a roundtable discussion with the local chamber of commerce Wednesday afternoon, explaining how government programs can help local businesses access international talent. “We’re attracting some of the most highly skilled workers in the world now,” said Hussen. According to the minister, immigration is working for this region, and credits a quicker streamlining process to allow out of country workers into Canada. Hussen admits the federal government still has to educate different groups on some of the programs that are currently being offered to facilitate access to talent and skills, such as the francophone program. Hussen tells CTV Windsor Canada has attracted 15,000 highly skilled people from around the world since June, 2017. 25-percent of those people are Americans, according to the Hussen. "There was a time when Canada used to lose its most talented individuals to the United States. Now, we're getting a lot of folks coming this way and it's because of our immigration system,” said Hussen. Local chamber president and CEO Rakesh Naidu said some of the government programs have not been used in the region, since the Global Skills Strategy was introduced. "I'm told that the time it takes to process is only ten days, so that's a program that needs to be leveraged more by our companies here,” added Naidu. He’s encouraging local companies to take advantage of the support, to help their business grow. "The more talent we're able to use, the better off all of us would be and better off our economy will be." Minister Hussen will meet with different stakeholders in Windsor-Essex and Chatham-Kent on Thursday. One of his stops is welcoming 40 new citizens at a special citizenship ceremony to be held at the Alzheimer Society of Windsor and Essex County.